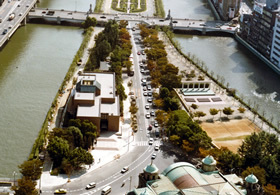 Nakanoshima Island, in which the Museum is located, is a sandbank formed in the center of Okawa River. In the beginning of the seventeenth century, a wealthy merchant Yodoya Joan developed this area and since then it turned into a flourishing economic center with kurayashiki (residence-warehouse) of feudal lords from all over the country built in a row and various commodities were collected here. The eastern end of Nakanoshima at that time was where the Osaka City Central Public Hall stands today, and the land further east which we see now is a result of deposition of sediments washed down by the river and later artificial development. 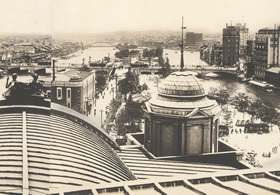 In 1879, the sanctuary of Hokoku Jinja Shrine was built on the land where the Central Public Hall stands today and Nakanoshima-dori Street was made as a front approach to the shrine. These developments led to the opening of hot springs and luxury restaurants in the area. Before the Museum was built, Jiyu-tei, a Japanese-style restaurant-and-inn founded in Kawaguchi foreign settlement by the lower reaches of Okawa River, opened a branch here, which was renamed Osaka Hotel in 1895 and in the next year they began their business as a Western-style hotel, known for its brick building. In 1905 the east section of the building was acquired by the Osaka Bankers’ Association, a council for leading banks in Osaka, to establish their office. After suffering from fire several times, Osaka Hotel withdrew from Nakanoshima in 1924. In 1922, the Osaka Bankers’ Association renovated the building and continued their business until 1966, when the deterioration of the building was used as an occasion to relocate their office. Over fifteen years later, The Museum of Oriental Ceramics, Osaka was founded on this site. There were various regulations upon designing the Museum building, including the height, form and color, in order to match the atmosphere of the park in which it was planned to be built. 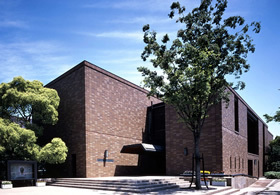 On the other hand, there was a determination to create a building that fits the museum’s image of exhibiting ceramics. Consequently, the present square building covered with porcelain tiles was made, which, to everyone’s surprise, seems to have unintentionally inherited the genes of the Osaka Hotel and the Osaka Bankers’ Association. While over 30 years have passed since the opening of the Museum and the landscape of Nakanoshima has changed dramatically after the redevelopment of the Nakanoshima Park, the Museum harmonizes well with the surrounding historical buildings and continues to be cherished by the citizens. The area was filled with camphor and Japanese zelkova trees and there were tennis courts and an outdoor concert hall before the redevelopment of the Nakanoshima Park in 2009. The outer walls are covered with porcelain tiles of different tones.